Elisabeth Campbell is a graduate student in the Classics Department at Johns Hopkins, where she is writing a dissertation on Roman victory cognomina during the Republican period. Through her work with the museum, Elisabeth has further developed a special interest in Roman epigraphy and numismatics. Measurements: Length: 30.5 cm, Width: 11 cm, Thickness: 1 cm. Date/Culture: Roman, c. 1st century B.C.E. Provenance: Purchased in Rome and donated to Hopkins in 1908. 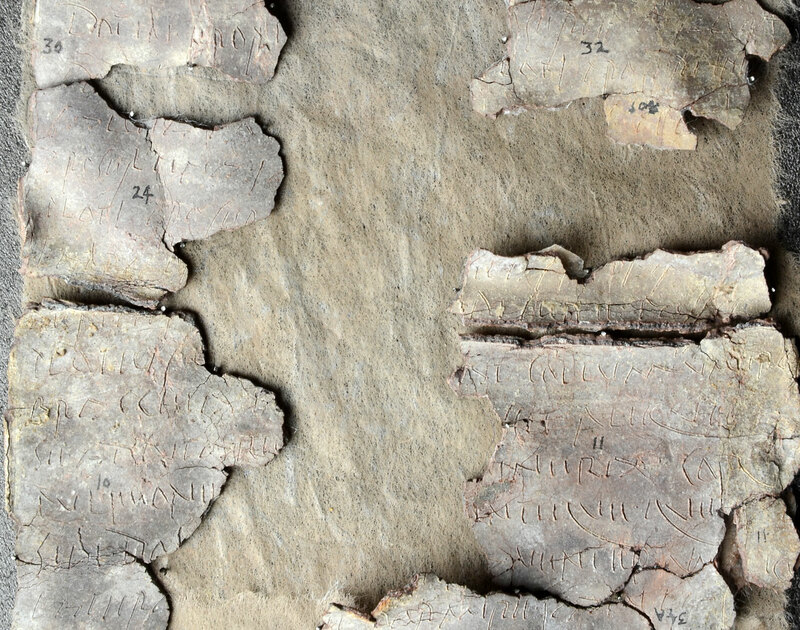 The Johns Hopkins Archaeological Museum contains fragments related to five lead curse tablets from ancient Rome. One of these tablets (JHUAM 2011.01) was recently conserved and placed on view, along with the original iron nail (JHUAM 2011.06) associated with it. Objects such as this one are evidence of a common practice in Greek and Roman antiquity to scratch curses onto tablets which were then deposited in wells or graves. While the earliest tablets only contained the name of the person to be cursed, later examples grew more elaborate, such as this example. Curses could be inscribed on basically anything, ranging from pottery sherds to gemstones, though lead is the most common material used for this purpose. The original nail used to "pin down" the five tablets in ancient times. At the top of the nail, lead fragments from the tablets are still attached in place. This particular tablet (JHUAM 2011.01) from the Johns Hopkins collection was found rolled together with four others and pierced through by an iron nail (JHUAM 2011.06). The Latin name for a curse is defixio which means ‘to pin down.’ While the individual tablets are stand-ins for the cursed persons, the nail symbolizes their pinning-down. All five tablets now in the Hopkins collection were written in Latin by the same hand, but contain curses against different people. In order for curses to be most efficacious, the individuals to be cursed were precisely named. This tablet contains a curse directed against a Plotius, identified as the slave of a woman named Avonia. Unlike the cursed person, the one uttering the curse was generally not mentioned by name; as a measure to prevent counter-curses. Dating to the mid-first century BCE (roughly the time of Julius Caesar), this tablet represents typical features of curse tablets from this period, and likely came from Rome. It begins by invoking Proserpina [Greek Persephone] and her husband Pluto [Greek Hades], the god of the Underworld, as well as the three-headed dog Cerberus who guards the entrance to the realm of the dead. Curse tablets were frequently addressed to the gods of the Underworld and those associated with it, such as Mercury [Greek Hermes] who guided the souls on their way to Hades. The curse then names its recipient, Plotius, followed by the ailment wished upon him. Plotius is to be consumed by fevers which are likened to him wrestling with another man. This very vivid metaphor describes the fever struggles of malaria which most likely is the disease wished upon Plotius here. After the ailment is mentioned, the person requesting the curse promises offerings to both Proserpina and Cerberus as a payment for their services. Cerberus is to receive dates, figs, and a black pig–one sacrifice for each of his heads. Proserpina is promised the body of Plotius himself as an offering, and the remainder of the text describes in detail every piece of his body and what exactly was to happen to it. Furthermore, the tablet specifies that these things are to be completed by the end of February, so that Plotius may not see another month. A detail of the tablet, showing some of the incised writing. The five tablets were acquired by the Department of Classical Archaeology of the Johns Hopkins University in 1908, and published in a dissertation by the then Hopkins graduate student William Sherwood Fox in 1911. Little is known about their exact provenance. It is also very likely that the tablets were deposited in a grave since curse tablets were often placed in tombs after the original burial. The idea was that the soul buried there would carry the curse to the gods of the Underworld. Tombs of those who had died young or by violent means were preferred because it was believed that their souls lingered restlessly near their burial site. Fox, W.S., “The Johns Hopkins Tabellae Defixionum” PhD diss., Johns Hopkins University, 1911. Fox, W.S., “An Infernal Postal Service,” Art and Archaeology 1 (1914), 205-207. Gager, J.G., Curse Tablets and Binding Spells from the Ancient World, Oxford; New York: Oxford University Press 1992.